Official artwork from Drill Dozer. 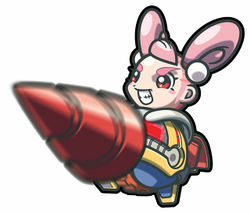 Jill (ドリ・くるり＆ラセンダー8, Dori Kururi & Rasenda 8) is the main character of the the Game Boy Advance game Drill Dozer. 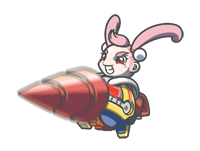 Jill is the playable character of Drill Dozer for the Game Boy Advance, her only non-Smash Bros. appearance. Her vehicle can walk, jump and attack foes with its giant drill. She is the daughter of Doug, who is the leader of the Red Dozers (a group of thieves). It is said that for years many group of thieves have been in search for the Red Diamond, which is a powerful diamond that would grant its owner any wish. Luckily Doug’s wife was the person who found it and gifted it to Jill before she died. Though the Red Dozers are a group of thieves, they are kindhearted and only protect the diamond instead of using it for corrupt wishes. Jill rides around the stage on her Drill Dozer, its drill spinning and dealing continuous damage and low knockback to fighters hit by it. Jill occasionally jumps, though not high enough to reach the upper platforms. Jill despawns after a while, though she can also fall off ledges. A young girl who takes over the leadership of a band of righteous bandits known as the Red Dozers from her injured father. Jill sets out on the Drill Dozer to recover a red diamond stolen by the Skulkers. Jill has great reflexes and rode the Drill Dozer instead of a baby carriage growing up. She has an intense dislike of studying, however. Jill returns in Super Smash Bros. Ultimate. 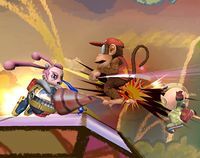 She appears as a Spirit alongside her Drill Dozer, but is no longer an Assist Trophy. Her Spirit can be summoned through cores from Duster (a fellow thief) and Drill Man (a character who also uses drills). Jill's official artwork for Brawl. This page was last edited on April 17, 2019, at 06:49.